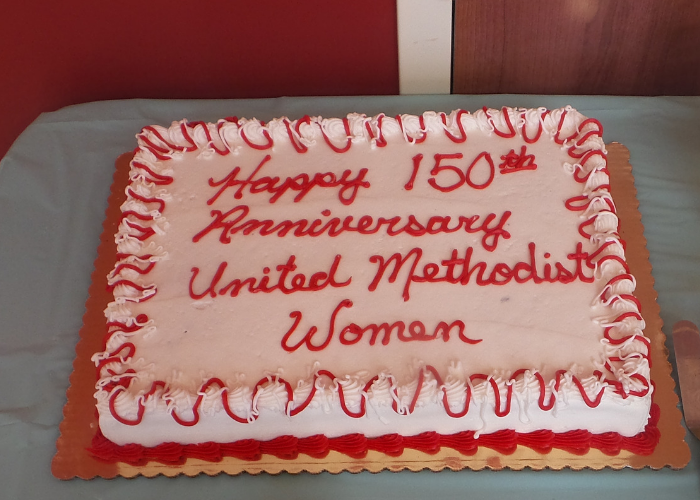 “Legacy, legacy, legacy,” was the operative word-of-the-day when the Baltimore-Washington Conference United Methodist Women gathered at the Mission Center March 25 to celebrate its 150-year anniversary. “We pray, study and march,” said Daisy Farmer, the conference UMW Legacy Liaison, as she welcomed about 60 enthusiastic women sitting at tables for six or eight. She outlined “what we’ve done,” since the founding of the organization in 1869. Sending the first missionaries to India, studies on many topics including major ones on Cuba, Haiti and Israel-Palestine, holding and attending missionary conferences, dealing with issues of poverty, disabilities, clean energy and many others the audience shouted out. It was quickly clear that these dedicated women were involved in their local churches, their districts, the Annual Conference and the world. Cates introduced Teresa Farmer to share her legacy story. Farmer, from Glen Burnie UMC, said that she joined because of her mother, a life-long member of the UMW and predecessor agency, the Women’s Society of Christian Service, who died last year at the age of 99. “In the WSCS, women had a voice in the church,” Farmer said, as she mentioned various activities she remembered her mother doing and enlisting her help for as a child. Fundraisers to support missionaries was important, she said. “Women are the biggest asset in the church,” one of her mother’s friends told her. Henrietta Cardle had a very different story. She came to the U.S. from Ghana for college. She emphasized the importance of community for her personally and in her outreach to others and credited the UMW with providing the scholarships that helped her to get through. Her main activity was opening an NGO to help her two home churches — one in Ghana, one in Liberia — to feed 280 hungry children every Saturday. This is not only providing for the physical needs of the community but helping it to stay alive and vital. “UMW doesn’t stay in its own corner, but is all across the world,” Cates said. 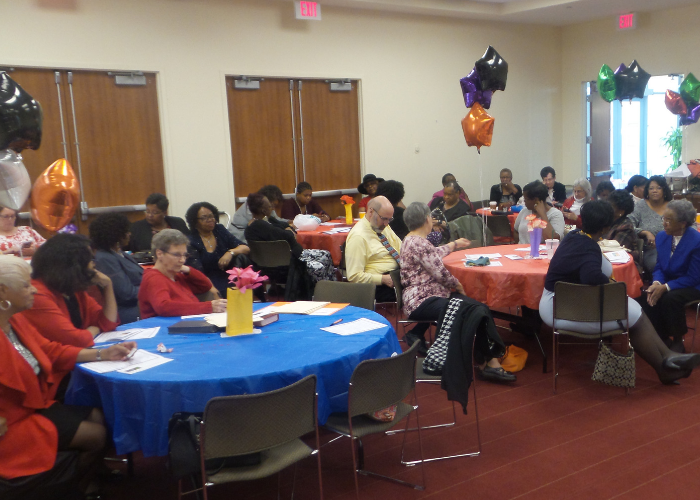 A table held a display of legacy artifacts with which the predecessor agencies, the WSCS and the Ladies Air Society, along with the current UMW, have been involved. The items on display included a large blow-up of the first 1-cent stamp in 1840, the Pony Express, a 1919 automobile, and up to early 21st century. Starting in 2017, the UMW gathered legacy stories, which have been published in a Journal, available at the event. “Working on it, I came to appreciate what women have done,” said Stephanie Willett. She shared several of the individual stories. The UMW has always been a supporter and promoter of the UMC Deaconesses, two of whom were introduced. Gertrude Dailey, a UMW member since before she was 30, now works with abused women. “I finally accepted the call to be a deaconess and the UMW has helped me all along the way over a period of years,” she said of first her refusal to hear God’s call on her life, then her acceptance. “It took a lot of study.” Being a deaconess is a lifetime commitment, she said. She now works at Metropolitan UMC in Annapolis as director of the food pantry and clothes closet. She mentioned Jane Grays, another deaconess, working in prison ministry, who is collecting children’s books to give to children of incarcerated parents. The afternoon program finished with a lively and amusing skit, written by Linda Yost, the BWC UMW president, to show the scope of the UMW over the past 150 years. It included voices from the Ghosts of Legacy Past, Present and Future. The Ghost of Legacy Past reminded the audience that the UMW is the largest faith-based organization in the U.S., with 800,000 members; and the Ghost of Legacy Future urged the audience to support the UMW Endowment Fund. The goal is $60 million, from which the interest will continue to support missions for another 150 years. Thank you so much for publishing this article. Our conference United Methodist Women work hard equipping, informing, leading and focused on mission dedicated to women, children and youth locally, nationally, and globally. United Methodist Women heed the call for action, give us a need, we are ready!! Knowing our conference is part of a long standing women's organization warms my heart.